It was once a common practice on this website to point out how often DC Direct schooled Mattel. Both companies are licensed to produce DC action figures, and often the product overlapped. For a long time, DCD came out on top. Recently though, the scales have begun to tip in Mattel's favor. They're beginning to get their act together, offering a variety of characters with lots of articulation and great Four Horsemen sculpts. DCD, meanwhile, continues to offer what it has for some time now: great sculpts, spotty quality and paint, inconsistent articulation and scale, little-to-no accessories, all at a premium price. At this rate, can it still be said that DCD is schooling Mattel? DCD and Mattel were once able to exist independently, since Mattel gave us the heavy hitters (Bats, Supes, etc.) while DCD focused on little-known characters in the DC Universe that nobody ever thought would see life in plastic. However, more and more, DCD has been producing more and more variations of major players like Bats and Supes, while Mattel has ironically varied its character choices. The DCD variations are typically comic-accurate and often based on the work of a specific comic artist. It was nifty for a while, but now even I'm beginning to tire of it. However, one guy's art that I'm not tired of seeing in plastic form is Alex Ross. 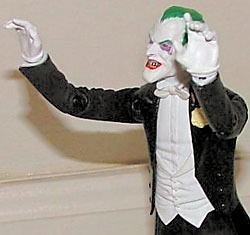 The third series of figures based on Ross's artwork from Justice, and there are many anticipated figures in this wave, including Green Lantern, Wonder Woman, and the subject of this review: The Joker. Ross's Joker has a receding hairline and dresses a bit more snappily than we're used to, but he's essentially the same maniac. What Ross does is make the Joker look real... even more than Jack Nicholson did in 1989. This was definitely the one I was looking forward to in this set, and while it's not really a bad figure, I can't say it lives up to all of my expectations. One of the things that may contribute to the disappointment I'm feeling is the amazing prototype photographs that the figure just doesn't live up to. I understand that there are bound to be discrepancies between the proto and the end result, but there are some simple things that could have been done to make this figure much better. Take, for example, the sculpt. It's great! Tim Bruckner is a great sculptor, and he's exceptionally good at translating Ross's work into three dimensions. The sculpting work is really well done. The problem is that an amazing sculpt isn't the be-all and end-all of a figure. For example, if attention is not paid to things like mold lines, a good sculpt can be made to look cheap and ugly. Every Joker I've seen on the shelves features a prominent, poorly matched up mold line running horizontally right across the figure's nose. When an obvious mold line is right smack dab in the center of a figure's face, you don't notice the great head sculpt... you notice the ugly mold line. But don't worry, that's not all DCD has done to soil Tim Bruckner's wonderful work. Another issue: the effect of twist ties on the figure. I collect lots of figures that utilize twist ties in the packaging, but only with DCD have the twist ties actually marred the figure permanently. The Joker, as with many other DCD figures I've purchased, has long thin impressions running across his pants thanks to the tightness of the twist ties and the crappiness of DCD plastic. The paint on the face doesn't help much, either. I know a lot of people are against washes [what! who? idiots!? --ed. ], but a figure like this is the perfect example of when a wash is necessary. Bruckner infused a lot of detail into the Joker's face, from the wrinkles on his forehead to the wicked creases of his smile. Unfortunately, all these details get lost under a flat white paint job. Lighting just isn't enough to bring out the detail; this puppy needed a wash. Another paint issue involves the lips: the lipstick on the final figure is neatly applied, but it makes it look like Joker's not smiling. The prototype clearly had the lipstick painted all the way to the mouth's upturned corners, so the smile was obvious. Since said upturned corners are all but invisible due to the lack of a wash, Joker's smile really gets lost. The purple eyeshadow is also inconsistent, thin and sloppy. The rest of the paint job isn't that bad, though. His eyes and teeth are well done, especially the black wash used between the teeth that makes them look truly disgusting. Joker's hair has a nice drybrushing of yellowish green to highlight the texture. His suit isn't just straight black: there's gloss on his lapels and boots. Nice. There's also gloss on his buttons... or rather, some of his buttons. I'm not sure what was going on here, but some buttons are shiny, and some just aren't. There's also different whites used on his shirt and vest. His buttons and bowtie are a pearly white, while his shirt, vest and gloves are a flatter white. Joker has some decent articulation in his upper body, but it's clear that he was only meant for one pose. He's supposed to be displayed with both arms in front of his body, with his hands resting on his cane. Any other pose doesn't look right, even though his shoulders and wrists are ball jointed, and his elbows are hinged. His arms, even with the elbow hinge, have a slight permanent curvature that makes him look silly if he's not resting on his cane or conducting an invisible orchestra. His ball jointed head works good, though, and Joker is one of the dozen or so figures in DCD history with a waist joint. Below the waist, however, we get absolutely nothing. No hips, no ankles, and certainly no knees. This is particularly annoying because the figure is sculpted to be leaning forward, and without a ball jointed torso or some joints in the hips, there's no way to get him out of the lean. It's another reason he looks silly doing anything but resting on the cane. As for accessories, he's got the cane and a large base. The Joker head on the cane has lots of cool detail, which is all very prevalent thanks to the utilization of a paint wash. If only the head of the figure itself were so lucky! As usual, the base is huge and takes up a lot of space. In the end, as I said, this isn't a horrible figure. However, thanks to the quality of the paint and the molding issues, he isn't as beautifully grotesque as he should be. And thanks to the lack of any articulation below the waist, and the pre-posed nature of his upper body, he's not a whole lot of fun to pose or play with. In the end, what should have been an amazing action figure and possibly the best Joker figure ever ends up being very ho-hum and lukewarm. It definitely doesn't help that DCD figures are typically over fifteen dollars apiece. I paid almost $40 for two figures, once tax and everything was included. I didn't pay much more than that for five Marvel Legends figures back in series 10, and it was enough to build the huge 18" Sentinel. When you compare what Marvel offers - great articulation with comparable sculpts and paint apps at a much more economical price - there's really no edge for DCD, unless you prefer DC's selection of characters. However, with Mattel's DC Superheroes line steadily becoming DC's answer to ML, and with DC Direct offering less of the obscure character selection that used to be its trademark, one really has to wonder: why buy DCD?